Amazing action packed Jousting Experience Days focusing solely on jousting training. Dress in some light medieval armour and colourful costumes and learn to ride like the Knights of old. Try one of amazing action packed Jousting Experience Days which focus solely on jousting training. Dress in some light medieval armour and colourful costumes and learn to ride like the Knights of old. 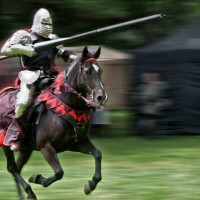 Learn the mounted knight skills required to strike the dreaded ‘Quintaine’; the target that spins on impact, lance the ‘Gold Rings’ and spear the ‘Peasant’s Heads’! All from the back of your very own horse with your lance! Learn to use a broadsword and enact a choreographed sword fight and you can optionally add a session in longbow archery. No riding skills are necessary, this event is open to all! Learn a choreographed broadsword fight straight out of a Film or TV series such as ‘Merlin’ or ‘A Knight’s Tale’ in pairs to perform to the rest of the group - points awarded for the most dramatic death scene! Learn to strike the dreaded ‘Quintaine’; the man shaped target that spins on impact, lance the ‘Gold Rings’ and spear the ‘Peasant’s Heads’! All from the back of your very own horse with your lance! Get ready to take on the Black Knight in a mini-Joust Competition. Do you have what it takes to knock him from his horse?! This will include an hour break for an extensive hot buffet lunch at the riverside Saxon Mill Pub next door to our base. Plenty of food of pizza, goujons, wraps chips, salads etc. and refreshments all included. The upper weight limit is 22 stone, with a minimum age 16 years. Minimum number of participants 8 people.